Streaming media From Your Library. Have you explored our links under entertainment, recently? A lot has been added in the last week. Under music we just added Music Online From Alexander Street Press. It is a huge collection that can be searched by artist , genre, instrument, and includes a large number of playlists. You can make your own playlist, too. To get into this database you will need your library card. However, my new favorite is in the movie section and it is called IndieFlix. 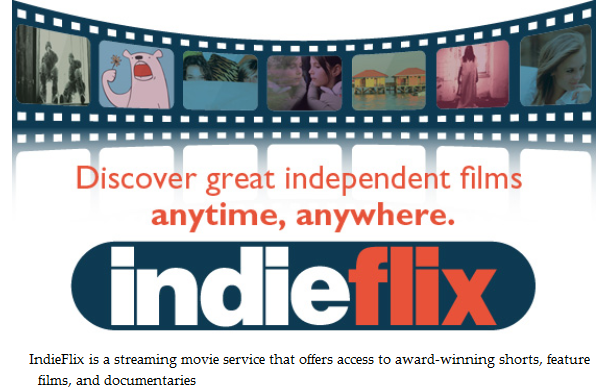 Indieflix is a database full of independent films that can be streamed to you computer.Some are classics like Nosferatu but there are also a number of new films . You can search by genre ( including Zombies), film festival, or even length of film. To get into this database, you will need to create a username and password, and then do it a second time. Yes, it is a double log in. Happily, they can be the same and my computer (and ipad ) remember my sign ins. There are so many, many good books published each year. How do you choose? You could ask friends, read the latest reviews, browse the new books. Or, you could use my favorite database, NoveList Plus, available through the Alameda County Library. Lately, I’ve become a fan of historical fiction, where I can immerse myself in past worlds and times. Currently, I’m traveling to ancient Egypt in the 18th dynasty, thanks to NoveList’s recommendation. Nick Drake has written an outstanding trilogy: “Nefertiti: The Book of the Dead;” “Tutankhamun: The Book of Shadows;” and finally, “Egypt: The Book of Chaos.” Drake’s writing style is “richly detailed,” something I appreciate. I also like mysteries so I get to meet a new detective from this series, Rai Rahotep, a “Seeker of Mysteries,” who investigates. NoveList lets you search by genre: you can choose from more than 20 lists of historical fiction ranging from Ancient Worlds to World War II. Or, you can choose titles from other genres such as mystery, fantasy, horror, science fiction, fantasy. And you’re not limited to fiction; you can explore non-fiction too. In addition, you can search by type of writing style: “richly detailed,” “compelling,” “engaging,” for example. Other searches include tone and storyline. When you find a title you might like, you’ll also get a short description – and information about the writing style, tone, pace, and storyline. If you’re logging on from home, you’ll need to have your library card ready in order to log in. Here’s the navigation: Our library Home page > Research > A – Z Resources > N > NoveList +. With NoveList, you’ll always have something to read, tailored to your tastes. While we are nearing the end of the month, I couldn’t let this opportunity pass to mention that this is American Heart Month. It’s likely that you or someone you know is dealing with heart disease. Did you know that heart disease is the number one killer of women and kills more women than all cancers combined? I found this out first-hand when a lovely lady who used to do my taxes, dropped dead suddenly from a heart attack. It was quite a shock, and got me wondering about heart disease, and what we can do to fight it. Each of those topics lead to links that give you strategies, recipes, and so much more. There are so many things you can do, like quitting smoking, that can make a difference in your heart health. I found this so useful that I have created a shortcut on my desktop so that I can quickly access the information this site contains. Women do so much for their families and others, so February is a good time to pause and think about taking care of yourself. I have a long ways to go to live more heart healthy. However, awareness and supportive information is a good start. Join me in Going Red for Women! Are you in grades 6-8? Do you like to read books and discuss what you’ve read (and have a lot of fun?) Consider joining Tween Page Turners. We meet once a month (the last Wednesday of the month) from 4-5 pm in conference Room A. We read a different book each month, and sometimes we read Advanced Reader’s Copies (books that are not yet published) and review them for the library. We currently are about half full, and are looking for new tweens to join us! If you are interested, please stop by the Children’s Desk to pick up a copy of the bookfor the next month’s meeting. If you would like any further information, or have any questions, please email Mary Ayers at mcayers@aclibrary.org. Feel like spending your Saturdays at the library? Do you like standing in front of a group of people eager to listen to your every word? Have an interest in passing on your knowledge to others? Well, if you are 18 or over, you might want to consider being a Computer Skills Co-Instructor at the Fremont, Newark & Union City Libraries. An understanding of computers and familiarity with Microsoft 2010 applications. Ability to communicate instructional concepts in an easy to understand manner. Must enjoy working with the public and with adults of all ages and skill levels. Patience and a sense of humor are required. Check out the “Growing Up Asian in America” display, second floor, Fremont Main Library for the entire month of February. Growing Up Asian in America is one of the largest celebrations of Asian heritage in America. Every year, over a thousand Bay Area students in kindergarten through grade 12 submit artwork, essays and poems. The 2012 theme was bridges in honor of the 75th birthday of the Golden Gate Bridge. This year’s contestants submitted works about bridges and what they can symbolize or do for us. A bridge can help us cross over an obstacle, like a river or a busy street. It can help us get through a problem or challenge in life. A bridge connects two things—like people, places or ideas. Even a person can be a bridge. You might cross a bridge when you go on a journey or trip, learn a new language, move to a new place or a new school, or make new friends. Everyone procrastinates sometimes, but 20 percent of people chronically avoid difficult tasks and deliberately look for distractions—which, unfortunately, are increasingly available. Procrastination in large part reflects our perennial struggle with self-control as well as our inability to accurately predict how we’ll feel tomorrow, or the next day. Procrastinators may say they perform better under pressure, but more often than not that’s their way of justifying putting things off.